Last night, my son started his nonsense again. I guess I had forgotten my promise to myself that I will not let him torture me again. Sometime I think he did it on purpose especially knowing that his dad is not around. I was really upset when hubby called. I willed myself not to talk about son to hubby. I chose to change topic and talk about something happier, I refused to let my son’s issue came between us. After a night of rest, I am a little happier today. Despite helper kept bringing up that suicide incident, I was still able to keep my mood up today. I refused to let myself get sucked into it. While waiting for my girl to be done with school, I met another mom. She was sharing with me her pain in raising her 18 years old son. In my heart, I was getting the “oh no”, for from her description, hers is so much identical to mine. Haizz…. I need to get myself mentally prepared for another 3-4 such painful years. Came home and wanted to bake something. With so much egg white left from the output of our ice cream making and making CNY goodies, I just had to clear them off slowly. Well actually it was WY that reminded me I had this book and it sure been a long time since I attempt more recipes from it. All bookmarked but no action. As most of my baking tins are already packed, I had to make do with those that are available. 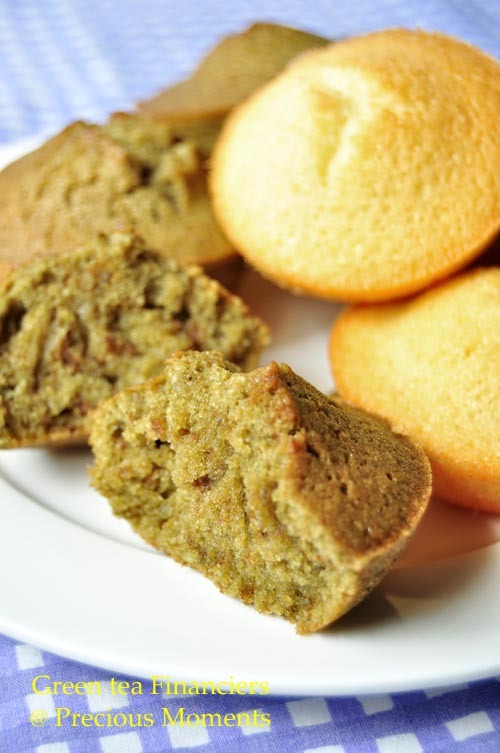 So using Chwee Kueh mould, I turned them into cute little Vanilla Financiers and Green Tea Financiers. As usual, green tea isn’t my little one’s favourite, she prefers the vanilla. Verdict: The vanilla is more moist than the green tea flavour but the taste of green tea is good. Perhaps I will decrease the flour ratio with green tea powder next round. I am so glad it is mid week. Today starts my first lesson in Pilates and it was fun. Thanks to AL for babysitting and feeding my girl after her tuition. Poor Edith, hope you're alright now. Yeah, it's never been easy to cope with the kids especially teenagers. I am almost half dead dueling with my boy since couple of years back and still is. As a mom, we definitely need huge patience as what in Chinese called 'yan'~忍. Life is tough but teaching kids even tougher. Other than that you should take more ginseng for 'air' improvement. hahaha..... Take care & be good. 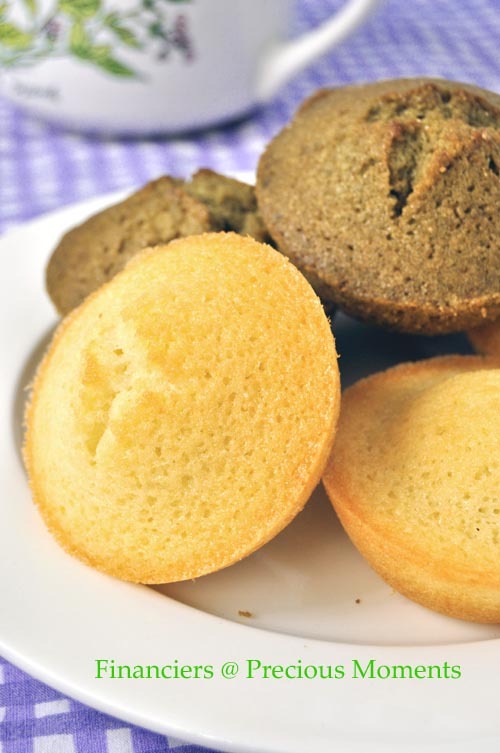 I think this financier recipe is definitely a keeper! The best thing they look so good even you baked them in "Chwee Kueh mould". Kristy, now my biggest worry is that he won't grow up in timne till it is too late. Unfortunately the word 忍 had already been pushed to its limit. I need to go 太山 to mediate. LOLz. Thanks Zoe, the vanilla ones are really nice and moist.